Sebastian Thrun – the project lead – giving a presentation about self driving cars in 2011 and showing a few of them in action here (it lasts 4 mins, 14 seconds). A video that Google produced with a twist near the end here (3 mins 1 second long). And the video of the new exploratory design announced this week here (2 mins 53 seconds). My brain diverted another way to most. Have you ever seen and experienced Uber? You open an app on your Smartphone, which identifies where you are located. You tell it where you’d like to travel to, and it will tell you (a) how long a wait until a taxi will arrive to collect you and (b) the fixed cost of the journey. If you accept both, your taxi is scheduled, collects you, drops you off and the charge made to your credit card. Done! The system is set so that both driver and passenger rate their experience, so that good service from both ends of the transaction is maintained. It’s probably well known that most cars purchased are tremendously under utilised and taking up valuable parking space in Cities all over the world. There are separate innovations where drivers can clock on and off at any time they wish, and obviously less resources available results in the pricing rising – to encourage more Uber drivers back online to service the demand. There are also periods of exceptional demand where Uber will jack the prices right up – transparently to all – to ensure there are the right number of drivers available to service the very busy customer demand periods (like rush hours). Uber have stirred controversy in the Taxi industry because anyone (with lack of bad references) can be a Uber driver, and part time working is a personal choice. Those who work full time, as self employed drivers, often get much higher pay than most routine licensed Taxi drivers; in New York, reckoned to be north of $90,000/year gross and (after car finance and depreciation costs) around $60,000/year. Drivers who operate part time can use the income to offset the cost of their cars, partly or completely, if that is their choice. 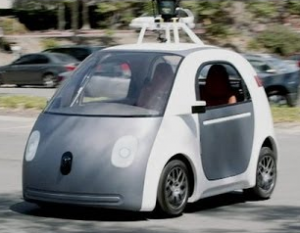 The bit that caught my imagination was what would happen if a City (or a private company) bought a fleet of these Google cars and hooked them into Uber. After use, they go to their next collection point or back to a well researched cache – ready for the best possible service to the next likely passenger. Or to the Petrol Station to be refueled (and I hope a manufacturer recall doesn’t end up with fleets of them working back to their factory, all at once!). I guess in the early days, there will be idiots on the road who’ll try to psych them out, but once an integral piece of local life, I think a Google/Uber combination would be tremendous. Not least, as yet another glowing example that paying for a shared resource is much cheaper than the inefficiencies inherent in expensive, rarely used Capital assets. CapEx is the past, OpEx is the future.